On a whim today, I decided to purchase a new keyboard. While perusing the electronics section, I happened across the Logitech G510. I had been eying this keyboard for some time, but at $120, I just wasn’t willing to shell out the cash required when I already had a perfectly good Logitech G15 sitting on my desk. However, today it happened to be on sale for a much more reasonable $89. Since setting this nifty little piece of gaming gear up, I have mostly fallen in love with it, even entirely geeking out at one point over the multitude of features. 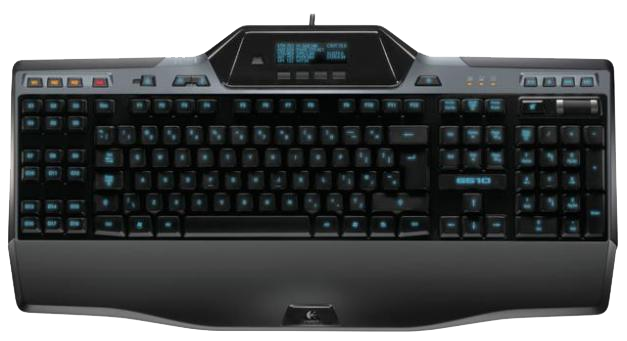 The Logitech G510 offers 18 programmable keys that are fully customizable. These keys can be set up to make distant key strokes closer, or, if you fancy, you can set up entire chains of keystrokes that will instantly be preformed whenever the corresponding button is pressed. Along with this, there are three programmable profiles so that you may save your layouts. Along with the programmable buttons, the G510 also offers multi-key input on the regular portion of the keyboard. Press any five keys at the same time and they will all be recognized, so you can do more things at once (great for all of the MMO players out there looking to get an edge on their DPS numbers). Everyone needs a Heads-Up Display right at their finger tips. the G510 (as well as many of the G-series keyboards) puts your gaming stats right at your finger tips. For instance, World of Warcraft players will find their base stats, base damage, durability average, and available bag space while they are in game. Not only that, but the G510 is fully compatible with Ventrillo, allowing you to see who is speaking whenever someone keys their headset. Finally, for all those who play with music in the background, your keyboard will also display what song you are listening to on Windows Media Player. Need to know which add-ons have updates available? The Logitech G510 also syncs with Curse Client to display the latest add-on information for add-ons installed on your computer! Finally, the comfort and customizable options for this keyboard are bar-none compared to any of the keyboards I have used. The G510 is a backlit keyboard that can be programmed to any color of your choice. Your keyboard will even glow black (… I didn’t know it was possible either, until I tried it.). The comfort while typing is also superb. The keys are light, requiring little effort for keystrokes, which enables you to move quickly to the next key, which is a wonderful advantage while playing FPSs and MMOs. This also makes regular every day typing seem to go considerably quicker. The only downside I have found I have found from switching from the G15 is that I do miss the multiple USB ports on the keyboard, however, the G510 makes up for this by having a 3.5mm headphone and microphone jack on the keyboard, both with their own personal mute buttons. Overall, the Logitech G510 is definitely worth the cost and I would recommend it to any gamer that is looking for a new keyboard. I’d even recommend it to those who aren’t looking for a keyboard, because, at the moment, its that good. I’m still using the Logitech G15 (V2), and I just spilt tea over it [again]. Perhaps it’s time for me to upgrade… Thanks for this article! (Btw, the keys don’t glow in black – that’s just not possible, well not yet anyway. They may be very dim (gray-ish), but not black.). As for typing on it, I would also say it’s just the same as most other keyboards I have tried – which excludes mechanical keyboards as I have not tried those. IE just these, I don’t know what they are called, ‘rubber buttons below the keys’-keybord. At least that’s what I suspect they are. Also, it’s a bit awkward to use in the beginning, as the left shift, tab, ESC keys etc are not at the far left anymore, but that of course is just due to the G-keys. I would want a little wider gap between the ordinary keys and the G-keys, but that would also make it a bit wider, and it’s pretty wide as it is. I have to say I like that there are three G-keys in a row, which makes it possible to remap WSAD if one wants to, for example. I also like that the keyboard layout is a standard layout (with the addition of the G-keys of course, and then the multimedia keys). The ‘disable windows’-switch is just brilliant! In addition there is in fact on-board storage to store profiles! Not much (30-32 kiB/kB or something). There is also something about profiles that is not stored in them, I don’t remember atm as there is a while ago I messed with it. Maybe the LUA scripts (not sure). Which brings me to the LUA scripting, not something I have meddled with a lot, just smallish tests but at least there is a possibility to make LUA scripts. Which is nice! The build quality could be a bit better too (yes, price – quality etc.. also with my rather little use I have managed to break off one of the legs under it, but then they are pretty fragile on most keyboards I guess). But, all in all I’m pretty happy with it, my first gaming keyboard btw. But, like you, it’s because I got it on discount (only that in Norway that ment that instead of paying something like $175, I paid $105, almost a year ago). Thanks for the vary honest opinion! Though, your space bar issue confuses me… I had to double check to make sure, but as far as the G510 I am using goes, there are no buttons underneath the space bar. The brightness on the keys could be a little better, I won’t disagree, but back when I was using a Razer keyboard, and even with the G15, the keys were just entirely too bright. I usually sit in the dark, and I really don’t find their brightness to be an issue, however, it could also be the color that I am using for them. Too bright lights presumably can be dimmed (I have never had the Razor nor G15, so I don’t really know about those), but the other way is a bit harder. But I agree that also can be a problem (but not on my G510). I’m sure you have at least one button in your space bar, or else it would be kinda hard to separate words when you write 😉 Maybe ‘button’ was a poor choice of words. In this case its a rubber switch thingy that is depressed by the keys on the keyboard and makes electrical contact. The G510 space bar have three, the only keyboard I have seen that have (has?) that! 2 – I have to go back on one thing I said – the three buttons underneath the space bar are not independent after all. I was so sure, as I got multiple spaces all the time. 3 – I’m not so sure the issue is fixed after all… but it might be improved (or so I hope). The three squares visible on the keyboard will be under the space bar key, and they are what I called (rubber) buttons. Btw the ones on each side of the space bar are also shorter than the middle one. And this time while I was at it, I tested the buttons and found they are not independent, so you will in fact NOT get another space if a space bar button is pressed while another one is already pressed down. Which makes it more of a mystery as to why it happens really. But it does. In fact as I write this post, I still get a few double spaces even after snapping those off. And now also the occasional no-space. So I’m not really sure the problem is fixed after all. Time will tell. And btw I’m sure doing this voids the warranty too, and might not be for everybody. Especially since it didn’t fix the problem entirely! Now I’m thinking its a debounce problem. But I’m not convinced of that either – the other keys seems okay but maybe the space bar is made different. (Sorry for the long-ish post). Not a problem at all! Your posts are at least entertaining to read and its always refreshing to hear what other people have had for experiences with a product! I had also entirely misunderstood what you meant about the three buttons under the space bar. I can’t say that I’ve had an issue with it yet, and I do *a lot* of typing for both GTN and work in general, but that is not to say that the problem does no exist. There is also a difference in manufacturing date, which does mean that there could have been improvements made, without mention of said improvements.